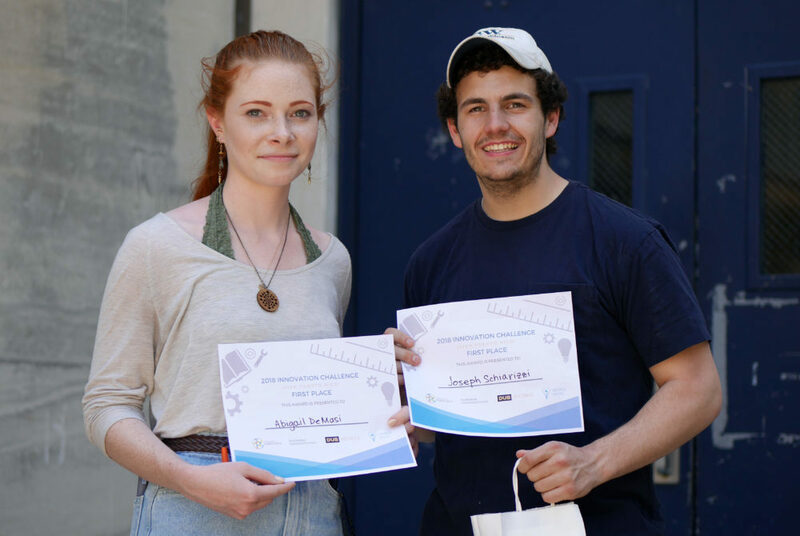 Seniors Abigail DeMasi and Joseph Schiarizzi won first place at an innovation competition Thursday afternoon, where students presented technological solutions to aid Puerto Rico in the aftermath of Hurricane Maria. Updated: May 6, 2018 at 12:37 a.m.
Student innovators presented new inventions to help Puerto Rico recover from a disastrous hurricane and aid future natural disaster relief efforts at a GW Innovation Center competition Thursday. The “Viva Puerto Rico” competition, which began in January, encourages students to develop solutions to common problems that Puerto Ricans faced after Hurricane Maria, like a lack of power and difficulty communicating. Hurricane Maria devastated Puerto Rico in September, cutting electricity for nearly all of the territory’s 3 million citizens for weeks after making landfall. The first-place winners of the competition, Joseph Schiarizzi, a senior majoring in computer science, and Abigail DeMasi, a senior mechanical engineering major, created an affordable and portable networking communication device that uses radio power instead of cell towers. “Ours uses radio frequency, which is a lot more resilient in the event of a natural disaster, and a lot of first responders already use radio devices, walkie talkies, things like that,” DeMasi said. Schiarizzi said the device will help in future natural disasters when storms destroy cellular service towers. “When storms destroy cell towers, there is no backup plan for communication, and in Puerto Rico, people could not contact their loved ones, and emergency workers couldn’t communicate for months after the hurricane because the cell towers were destroyed,” Schiarizzi said. Contestants submitted a summary of their ideas Jan. 8, and finalists were announced 10 days later. The competitors showed prototypes of their creations at the end of January before the final judging took place Thursday afternoon. The prizes for placing in the competition ranged from $1,000 to $2,500. Students and event organizers said the inventions are real-life ways to make an impact in Puerto Rico and other areas devastated by natural disasters. Alina Kline-Schoder, a senior majoring in biomedical engineering, helped to create a device that collects rainwater and boils it using heat from the sun, which then spins a turbine and creates electricity. She did not place in the competition. Kline-Schoder said she has never participated in an innovation competition before, but the idea of helping Puerto Rico influenced her decision to join. She said she had a high school friend who is from Puerto Rico who escaped the disaster, but her town was still damaged. “For me, personally, this was a great challenge to do something for one of my friends,” Kline-Schoder said. “We are looking for low cost and manufacturability in Puerto Rico, so it can be assembled in Puerto Rico using mostly local material, so that people not in the big cities still have a chance to make use of some of the innovations that come out of the contests here,” Graves said. Erica Wortham, a project lead at the GW Innovation Center, said the event also highlighted other aspects of Puerto Rican culture, like food and music. Officials screened the documentary “Puerto Rico: Citizens in Peril,” which focuses on the devastation of communities in Puerto Rico following Hurricane Maria. The Hatchet incorrectly reported that senior Joseph Schiarizzi is a mechanical engineering major, and senior Abigail DeMasi is a computer science major. Schiarizzi is a computer science major and DeMasi is a mechanical engineering major. We regret this error.